which is the only energy option that is both poison-free and inexhaustible. Welcome to the Home Page of the Phoenix Project website. Our home page begins with the exponentially worsening energy, environmental and economic problems, and ends with a with the only fundamental solution, which is to rise from the highly-toxic ashes of all fossil and nuclear fuels to a wind and solar powered hydrogen production, storage and engine conversion systems that are shown below that have been in use since the 1800’s. Thus no R & D is needed to implement a Solar Hydrogen Age of sustainable prosperity without the toxic chemical contamination that is making the Earth uninhabitable. 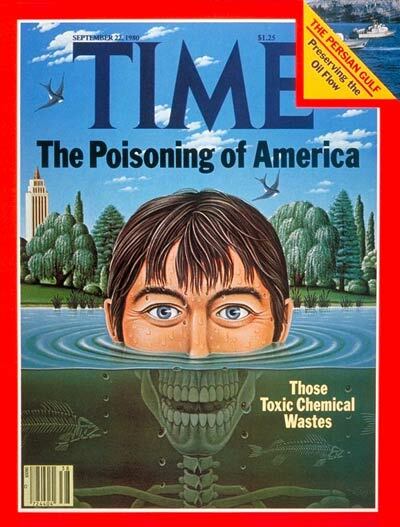 The Time magazine shown above was published in 1980, and a similar cover story was published by Time in 1985, but such ominous new reports are no longer covered in the corporate-owned news media that is now owned and censored by the major oil & gas, chemical and pharmaceutical corporations. The U.S. energy, chemical and agricultural systems are now primarily based on mass-producing vast quantities of chemical and radiological poisons each year, which are so “ubiquitous” on the Earth that they now arrive in the wind and rain. It is why these poisons are now in blood and brain of every many woman and child worldwide, including the unborn who now soak in a witches brew of poisons from the point of conception. The result has been epidemics of cancer, Autism and Alzheimer’s, which alone are bankrupting the USA, while making the Earth itself uninhabitable. As such, a A State of Emergency clearly exists, which is why it is necessary to replace all fossil and nuclear fuels with solar-sourced hydrogen with wartime-speed (i.e. within 5 years). But before such a “transition of substance” can take place, the army of industry lobbyists from the oil and nuclear industrial complex must be overcome, and the only way that is going to happen is if the majority of voters in the U.S. are able to take charge of the Federal and State governments by passing a 28-word Democracy Amendment that will empower the majority of voters to approve all laws and judicial decisions that impact the majority. Details are on the DemocracyAmendmentUSA.net website, including the “trigger mechanism” to pass and ratify this amendment with an Article V Citizen Ballot that can be downloaded as a paper ballot, which can then be mailed to the respective Secretary of State where the ballots can be verified, counted and archived. The National Academy of Sciences has testified that the use of oil, natural gas and other highly-toxic fossil fuels have already destabilized global climate and food production systems, as the Earth accelerates into the final exponential stages of its 6th Mass-Extinction event in its 4-billion year old history. 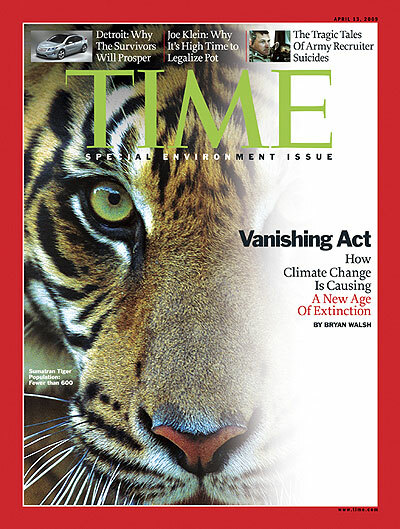 While this is not common knowledge, it is important to note that Time also ran a cover story on this 6th Mass-Extinction event on April 13, 2009. 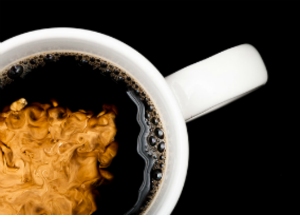 Diffusion occurs every time cream is poured into coffee, and note the same process occurred in the nuclear accident in Fukushima, Japan. 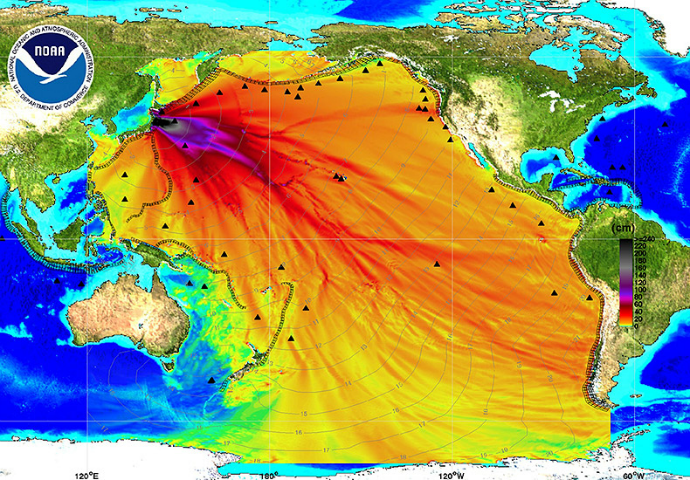 Note how the radiological poisons from Fukushima diffused in the Pacific Ocean over a period of 24 months. This is why even the animals living n the remote regions of the Arctic did not escape the global toxic chemical contamination because of the immutable process of diffusion. The Earth and its atmosphere is like one large glass of water that is being continually stirred by the energy from the sun and wind, and if any chemical or radiological poisons are released anywhere, they will soon be diffused everywhere, and into every living organism, including the primordial proteins that are now being destroyed, which are at the foundation for the all life on the Earth. Oil-based chemical poisons literally dissolve the highly-complex three-dimensional structure of proteins, which are critical for all metabolism and memory, causing epidemics of dreadful diseases that are now bankrupting the U.S., including cancer, Autism and Alzheimer’s. Moreover, as the global chemical contamination continues, there will soon be no one left to care for anyone else, as the oblivion scenario for the human species runs its tragic course. Yet few Americans are aware that the use of toxic oil, coal and natural gas was never necessary, because hydrogen made from water with electricity was demonstrated with international news coverage in the year 1800, and the world’s first automobile made in 1807 was using poison-free and renewable hydrogen fuel from water, and not gasoline from oil. As such, a global energy, economic, environmental, healthcare, educational and political State of Emergency now exists, and the obstacles to implementing solutions with wartime-speed are not technical — but political. Why Oil, Chemical & Pharmaceutical lobbyists made Cannabis illegal. 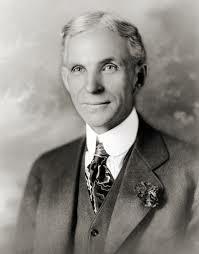 Ironically, the least expensive method of making hydrogen is to use cannabis crops, which Henry Ford was doing in the 1920s and 1930s to make both ethanol that was half the cost of gasoline, as well as ultra-high quality plastic fenders, hoods and other body components that are 30% lighter and 10 times stronger than steel. Equally strong cannabis fibers were used to make interior carpets and upholstery in Ford’s cannabis cars, which he said one could simply bury when the car was worn out. 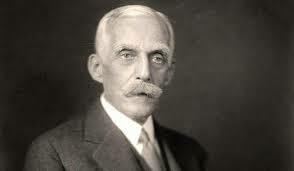 However, when oil baron Andrew Mellon was appointed to be Treasury Secretary, he was also secretly the major investor in the DuPont chemical corporation’s patent to make plastics from oil instead of cannabis. 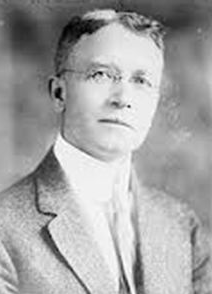 Thus to protect his investments, Mellon spearheaded an effort of lobbyists to make cannabis illegal in 1937, with no recorded vote in either the House or Senate, and over the objections of Henry Ford and the American Medical Association, whose representative was Dr. William Woodward, who was an attorney as well as a distinguished physician, who was excluded from all of the secret meetings between the oil, chemical and pharmaceutical lobbyists and the key Members of Congress they were bribing. An extraordinary documentary on this mostly unknown part of American history is summarized in The True History of Marijuana. Dr. Woodward’s testimony, that is available online, indicated he objected to using the new word “marihuana,” which he called a “mongrel” term that had no place in medical science. He further testified that the AMA was aware of no evidence that cannabis was a dangerous drug, especially given it was used as a major component of most of the medications that were in use since the country was founded. But what Dr. Woodward did not realize was that John D. Rockefeller was another oil baron who wanted cannabis to be removed from the market because he was heavily investing in replacing all of the natural non-toxic herbal plants like cannabis and morphine, which had been in use worldwide long before civilization began, with highly-toxic and much more expensive — and profitable – synthetic pharmaceutical drugs. And it is now known that the pharmaceutical are now killing vastly more Americans each year than all of the illegal drugs combined, as do alcohol and tobacco. It is important to note that the prohibition against alcohol in the 1920s required that a constitutional amendment be ratified, because Article 1 of the U.S. Constitution does not empower the government to dictate what foods, drinks, medicines or smoking mixtures that citizens may choose to consume. Given no constitutional amendment was ever introduced, much less passed and ratified to prohibit cannabis, the so-called “drug” laws are blatantly unconstitutional. Moreover, the drug laws were also clearly unscientific, which is why they were opposed by the American Medical Association, but with trillions of dollars of profits at stake, Dr. Woodward was ridiculed and asked to leave the hearing since his organization would not support the prohibition of cannabis. Thus the combined power of these oil, chemical and pharmaceutical industry lobbyists not only made cannabis and morphine illegal in the U.S., but they also used U.S. influence at the United Nations to make cannabis and morphine illegal worldwide. But the net result has been the chemical contamination of all life on the Earth, which is due to the immutable laws in physics called diffusion. It is tragic that the oil industry corporate lobbyists won in their efforts to remove cannabis from the market, because in addition to arresting and destroying the lives of over 45 million otherwise innocent Americans, the resulting drug war was directly responsible for the shift from a renewable and poison-free “solar cannabis economy,” which had sustained human civilization for thousands of years, to a highly-toxic and non-renewable “oil & fossil fuel economy,” that in one generation has contaminated the air, water and food worldwide, along with every man, woman and child. The toxic continent-sized plastic islands shown below would not exist if the plastics were made form cannabis, which is completely non-toxic and biodegradable. Details on the global chemical contamination from fossil and nuclear fuels are provided in The Poisoning of America 2014 ebook available on the Phoenix Project ebookstore. According to the December 2004 issue of Scientific American, the THC in cannabis is not a toxic drug, but a 500-million-year-old neurotransmitter in humans other vertebrate animals, which has redefined the science of neurology because it is know known THC switches on a two-way communication and feedback system in the brain and gastrointestinal system. 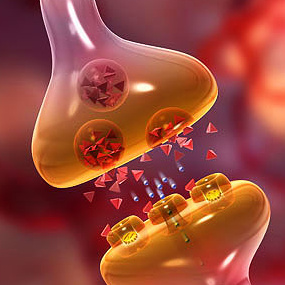 tion Neuronal synapses exchanging neurotransmitters. The authors of a Scientific American paper, “The Brain’s Own Marijuana” December 2004, are medical professors Roger A. Nicoll and Bradley N. Alger, who found the brain makes its own substitute molecules “endocannabinoids,” for the vast “forests” of cannabis protein receptor’s, which have been in the brains and bodies of all vertebrate animals (which includes all humans), for the past 500 million years. Moreover, the body’s version of the THC molecule does not stimulate the protein receptors as well as the THC that is found in cannabis plants. These insights stunned these investigators, given that 500 million years goes back to a time before living organisms had left the seas. The Earth’s protective ozone layer had not yet been formed from the photosynthetic microbes who were in the process of making hydrogen from water, which released the massive amounts of the oxygen needed to form the stratospheric ozone layer. To make matters even worse, the current mindless policy of the hydraulic fracturing (i.e., fracking) of shale rock under high-pressure in order to produce oil and natural gas is now permanently poisoning billions of gallons of vast interconnected underground aquifers for a relatively insignificant amount of toxic gas. While the Obama administration touts the industry propaganda of a 100-year supply, The U.S. Geological Survey and the U.S Energy Information Administration, the major shale gas reserves will start declining by 2020, if not sooner. 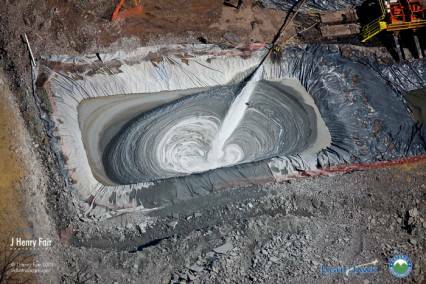 Over 5 million gallons of precious fresh water is contaminated at each fracking site, which only lasts about 24 months, and then contaminated water is injected thousands of feet into the Earth, where the long-lived chemical poisons will be contaminating underground aquifers essentially forever, which makes the property worthless. 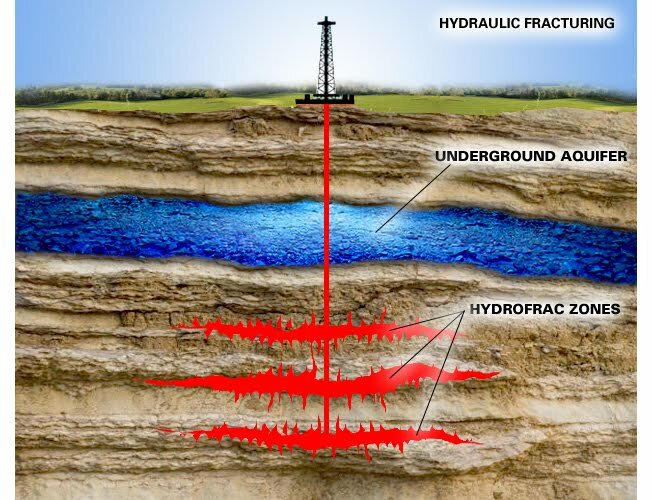 In addition, the the high-pressure fracking process that breaks shale rock also causes geologic faults to slip, causing earthquakes in many areas. This is of particular concern because thousands of fracking sites are now located in Southern California where hundreds of faults, as well as the entire Pacific Plate that could shift at any moment. And while that alone will be a catastrophic event, it will be a minor catastrophe compared to the two “supervolcanos” in the U.S. that scientists have warned could also erupt at any moment. While no one can know exactly when volcanic eruptions are going to occur, one of the most imminent supervolcanos is located in Mammoth, California, and the other even larger one is in Yellowstone. And it’s not a question of whether — but when these major eruptions are going to occur. Yet the existing federal and state governments are doing absolutely nothing to prepare the American people for these eruptions, such as building lifeboat food production systems, which will absolutely insure that no one will survive what is coming. Details and images of the past eruptions of Yellowstone are proved below. The Yellowstone eruption is going to create a decade of winter. The question is will we be ready? 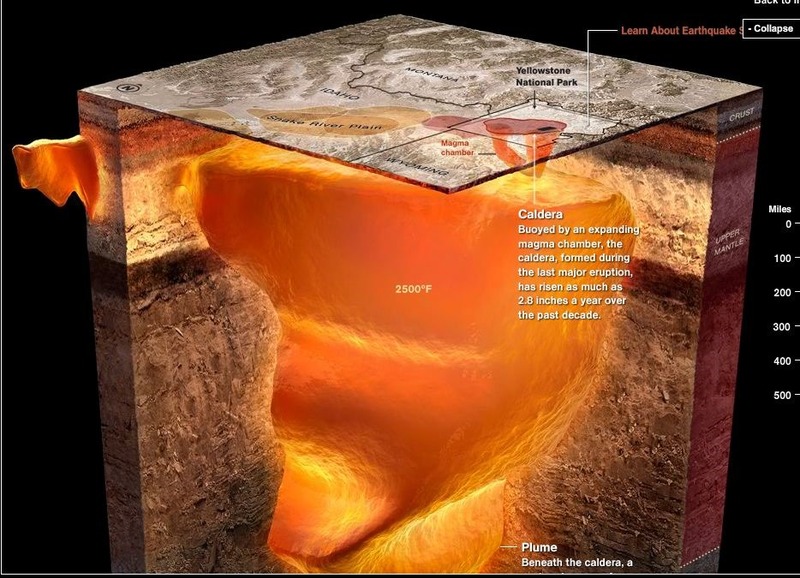 Scientists at the United States Geological Survey (USGS) have been carefully monitoring and mapping the massive Yellowstone Caldera for many decades, and they have indicated the volcano is well past due for a major eruption. 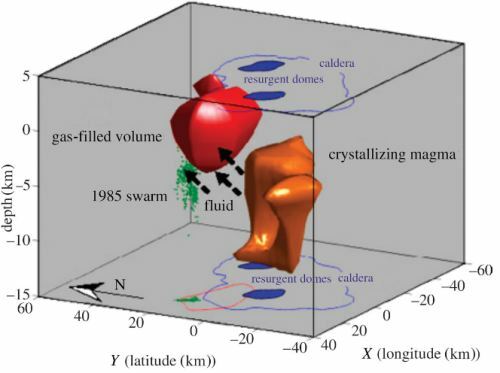 All of the key warning signs, including the forests dying because their roots are being cooked, the surface is actually rising, and there have been increasing swarms of tremors in recent years, suggesting that an eruption could be imminent. While some volcanos have a surface crater that is one mile across, the Yellowstone supervolcano eruptions, which have occurred many times in the past with great regularity every 600,000 years, typically had creators that are are over 50 miles wide, which can emit enough ash and other particulates to end growing seasons and thereby create global mass-extinction events. But even if governmental officials were aware of the exact time of the eruption, they may well choose not to inform the public simply because they assume that nothing could be done in any case. However, there are millions of Americans are now being paid not to work, and millions more who desperately need any kind of work, and if the trillions of dollars that is being used to bomb people in Oil Wars abroad was used instead to build Lifeboat Ark systems in every community, Americans could not only survive, but prosper in the climate change chaos that is now inevitable. It is also worth noting that if the volcano takes its time in erupting, the poison-free food produced in such Lifeboat systems would be vastly superior to that which is now produced in the poison and sugar-laced, highly processed factory junk food products that are now the only option for the vast majority of Americans. 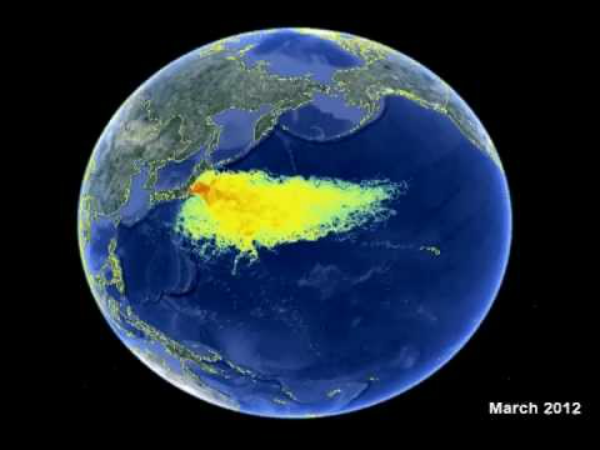 When this eruption does occur, the ash and particulates that will be put into the atmosphere and stratosphere will block out the direct sunlight needed for conventional agriculture systems for up to 10 years. As such, wind and geothermal energy conversion systems will be critical, because without Lifeboat food production systems, civilization will perish in an Oblivion scenario where billions of people and other animals will starve to death in the cold. While humanity is now confronted with a bewildering array problems, it is important to be aware that shifting to a Solar Hydrogen Economy is a unified solution to many of the most serious energy, economic, environmental and health care problems, but the first order of business is to mass-produce Lifeboat systems with wartime-speed. The Solar Hydrogen Economy and energy systems that will power “Lifeboat” Food Production Systems in spite of the climate chaos that is inevitable. Given it is now reasonable to assume that the abrupt climate change event is now well underway, the only way to minimize what is coming is to fundamentally change course by initiating a “transition of substance” to a Solar Hydrogen Economy, which will incorporate “Lifeboat” indoor organic food production systems. Even without the threat of abrupt climate change, the existing food produced in large centralized pesticide-based corporate factory farms needs to be replaced with locally grown indoor organic fish, vegetable and fruit crops that will also be protected from climate change chaos. As such, these are true”lifeboats” that can make the difference on whether humanity survives or becomes extinct. One of the first commercial prototypes of a “Lifeboat” controlled indoor agricultural system was developed in Illinois in the 1980s by engineer Noel Davis, whose one acre building, which was similar in size to a modern supermarket, produced over 100 acres worth of produce with 13 crops a year. This generated an average of 16 tons of high-quality produce a month, with no sunlight, no sand, no bugs, and no pesticides. Other investigators, including Aquapoinics.com have integrated indoor closed loop agriculture and aquaculture systems. There are many other individuals who have pioneered indoor agricultural systems, including author Dickson Despommier, who wrote The Vertical Farm, and who also has information on his www.verticalfarm.com website. Large-scale indoor Lifeboat Ark Food Production Systems need to be mass-produced for each community with wartime-speed, like the Liberty Ships and Victory Gardens in World War II. Unlike other energy plans proposed by the last eight Presidents, Al Gore, John McCain and or T. Boone Pickens, the Phoenix Project plan to shift to a Solar Hydrogen Economy is the only detailed technical and economic proposal that can make the U.S. energy independent of not just imported oil, but all fossil & nuclear fuels by 2020, by mass-producing wind and other solar powered hydrogen production systems that could have been mass-produced in the 1920s. 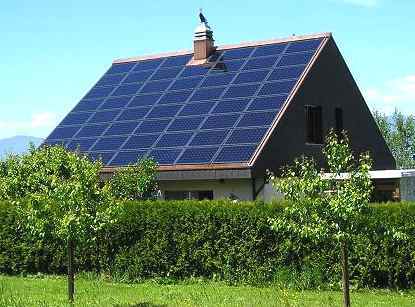 There are a wide range of solar energy technology options, including photovoltaic cells, that generate electricity from sunlight quietly with no moving parts, as well as solar thermal technologies, which include line-focus trough systems, central receiver power towers, and point-focus dish engine systems. 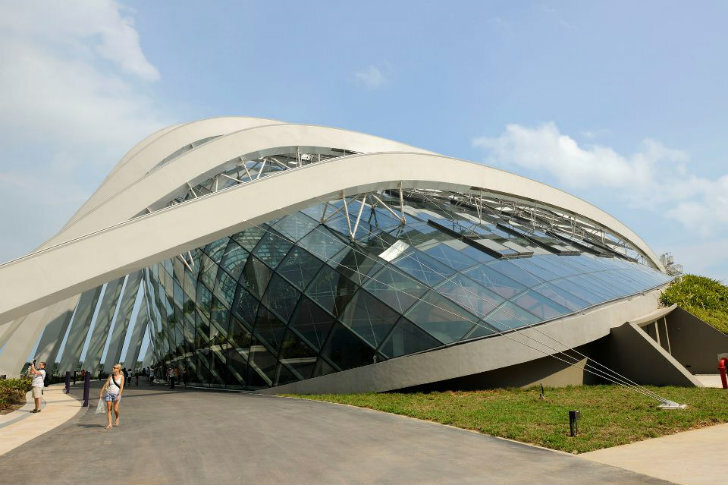 Other solar technologies include wind, wave, ocean current and ocean thermal energy conversion (OTEC) systems. Of all of these primary options, wind systems have been able to generate electricity for significantly less cost, although recent major advances have dramatically increased the efficiency and simultaneously reduced the cost of photovoltaic systems. A residential solar hydrogen home with photovoltaic solar cells. However, with the exception of OTEC systems, which will be discussed in more detail below, all of the other solar technology options have a fundamental problem that has limited their use, which is that they are intermittent resources. The sun only shines during the day when the weather permits, and wind systems often operate at night, when there is little or no need for the electricity. This is why wind and other solar technologies are typically only able to operate about 30 percent of the time, and no one can predict when that 30% of the time will be. As such, most solar technologies are unpredictable. Utility companies refer to this problem as “dispatchability,” which simply means that when someone flips a light switch, they expect the power to go on 24/7, regardless of weather conditions (unless of course storms knock out all of the power). That is why utilities prefer to use power plants that are fueled by hydrocarbon fuels like coal, natural gas and other fossil fuels or uranium-fueled nuclear power plants, and since hydrogen is a universal fuel, all of the existing fossil fuel and nuclear facilities can also be modified to use hydrogen made from cannabis, or from water with electricity generated by the wind and sun. Hydrogen is the simplest, lightest and most abundant element in the universe, and it has long been viewed as the Holy Grail of energy and sustainability because it can unite all energy sources with all energy uses, and it can be a completely non-toxic and carbon-free, “universal fuel” that can displace the use of gasoline, diesel fuel, natural gas and all other fossil and nuclear fuels worldwide by powering every existing vehicle and power plant with wind-powered hydrogen production and engine conversion technologies that were in use in the 1800s. Unlike electricity, hydrogen can be stored and transported in trucks, pipelines and ships, and delivered to markets worldwide, and unlike electricity, hydrogen is a universal fuel that can power any existing engine, power plant, or appliance, including a Coleman stove operating on a mountain top, as well as the engines of the Saturn V Moon Rockets and the Space Shuttle. Hydrogen makes wind and other solar technologies practical for large-scale use because it solves the intermittent problem of the wind, which changes its velocity from second to second, and other weather-dependent solar technologies by passing the electricity from the wind and other solar technologies through water, which causes the water (H2O) to be split into its primary elements of hydrogen and oxygen. This process is referred to as electrolysis, and it was first officially demonstrated in the year 1800. Thus if the wind is blowing in the middle of the night, it doesn’t matter because the electricity can be used for hydrogen production, and hydrogen is the only “universal” fuel can then be used to power any existing automobile, aircraft, ship, train or power plant that is now fueled by coal, diesel, natural gas or uranium. As such, hydrogen production is what makes wind and other solar technologies “dispatchable” and therefore practical. Benjamin Franklin was one of the early and passionate investigators of electricity, and in June 1752 he attached a metal key to the bottom of a dampened kite string and proceeded to fly the kite in an electrical thunderstorm. But producing and using electricity was a difficult process, and it was not until the year 1800 that an Italian scientist, Alessandro Volta, demonstrated that it is possible to predictably produce an electrical current by soaking paper in salt water, with zinc and copper electrodes on opposite sides of the paper so the current could flow from the chemical reaction. 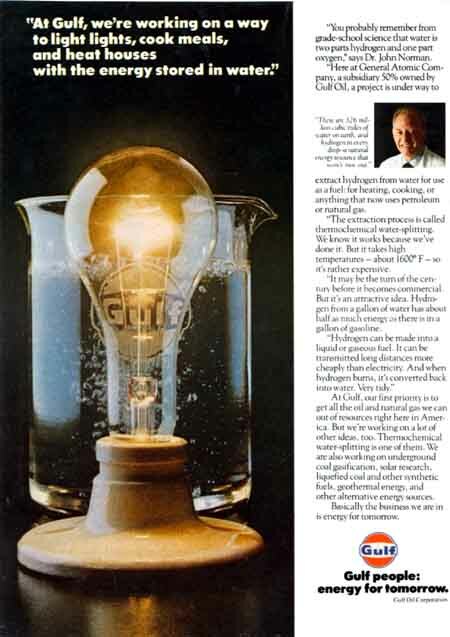 With this predictable source of electricity, it only took a few weeks before Sir Anthony Carlisle, an English surgeon and his colleague William Nicholson, a renowned English chemist, discovered that when the electrical current was passed through water, a process now called electrolysis, the water molecules (H2O) are separated into hydrogen (H2) and oxygen (O). It is important to note that the process of electrolysis is approximately 60 to 80 percent efficient, which means more energy is used than is generated from the process. This is only a problem if the electricity is being generated from a depletable energy resources like fossil or coal nuclear fuels, but if the electricity is provided by a renewable solar energy resources, the resulting solar hydrogen system can operate indefinitely. The first hydrogen fueled automobile was built in 1807, and in the 1920s and 1930s, thousands of engines and vehicles in UK and Germany, including submarines, were modified by Rudolph Erren to use hydrogen and gasoline interchangeably. In 1923, the use of sea-based wind powered hydrogen production systems was proposed at Cambridge University by John Haldane, a professor of genetics and biochemistry who was well aware that photosynthetic plants had been making hydrogen from water with sunlight for billions of years. However, it was not until the 1974 that the first international scientific and engineering conference on hydrogen energy was organized and Chaired by T. Nejat Veziroglu, a professor of engineering at the University of Miami, who was also Director of the university’s Clean Energy Institute. The Conference was held in Miami Beach, Florida and it was called “The Hydrogen Economy Miami Energy (THEME) Conference,” where the concept of a Hydrogen Economy was formally proposed. The Hydrogen Economy would protect the planet earth – the only planet known to be hospitable to human life – while delivering clean, abundant energy, leading to a higher standard of living. This seemed a noble and worthwhile idea, and it was decided to establish an organization dedicated to the ultimate establishment of the Hydrogen Energy System. This Organization, the International Association for Hydrogen Energy, was formed by the end of 1974, with Dr. Veziroglu as the Founding President. 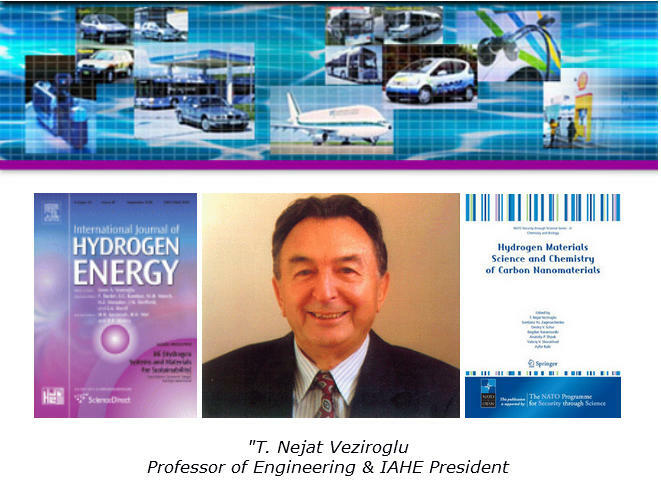 Under his leadership, the IAHE Board of Directors established the International Journal of Hydrogen Energy (IJHE) in 1975, and Dr. Veziroglu served as its Editor in Chief in order to help review and disseminate information related to virtually every aspect of hydrogen production, storage, distribution and end use as a chemical feedstock or fuel in a Hydrogen Economy. The IAHE Board organizes World Hydrogen Energy Conferences (WHEC) every two years with major universities and companies, and has also established World Hydrogen Technologies Conventions (WHTC) to work with the increasing number of companies that are now developing and refining hydrogen energy technologies. These hydrogen organizations continue to provide platforms and forms for scientists, engineers, environmentalists, decision makers and thinkers interested in the future of human civilization and the planet Earth. Dr. Veziroglu is a native of Turkey, and he graduated from the City and Guilds College, the Imperial College of Science and Technology, University of London, with degrees in Mechanical Engineering (A.C.G.I., B.Sc. ), Advanced Studies in Engineering (D.I.C.) and Heat Transfer (Ph.D.). After serving in some Turkish government agencies as a Technical Consultant and Deputy Director of Steel Silos. After heading a private company, he joined the University of Miami Engineering Faculty, and served as the Director of Graduate Studies, Mechanical Engineering (initiating the first Ph.D. Program in the College of Engineering), Chairman of the Department of Mechanical Engineering, the Associate Dean for Research, and the founder and director of the University of Miami’s Clean Energy Institute. Veziroglu has published some 350 scientific reports and papers, edited over 200 volumes of proceedings. He has membership in some twenty scientific organizations, has been elected to the Grade of Fellow in the British Institution of Mechanical Engineers, the American Society of Mechanical Engineers and the American Association for the Advancement of Science. Note the spherical hulls that are used in the Windships both above and below, where the crew will live and work. Electricity generated from the wind turbines is used to separate seawater into oxygen and hydrogen, while providing a vast sanctuary for the fish and other marine organisms that are now being hunted into extinction. 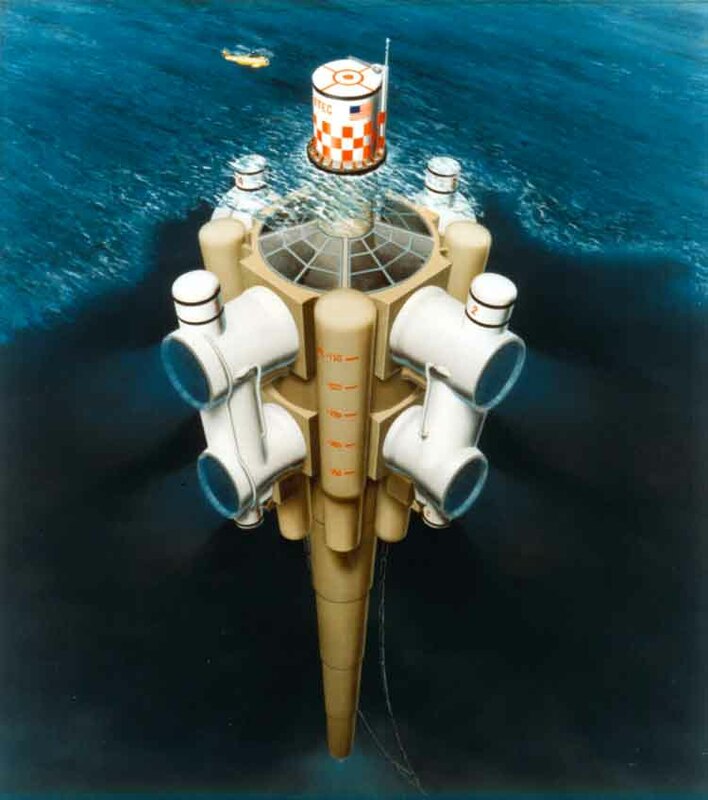 While the wind systems alone could generate enough hydrogen to displace all fossil and nuclear fuels, Ocean Thermal Energy Conversion (OTEC) systems, like the one shown below that was developed in the 1970’s by Lockheed and Bechtel, could also displace all fossil and nuclear fuels now used worldwide forever. OTEC plants are the only solar energy system that operates 24-hours a day, seven days a week, regardless of weather conditions, and OTEC systems generate vast quantities of fresh water and seafood as by-products. 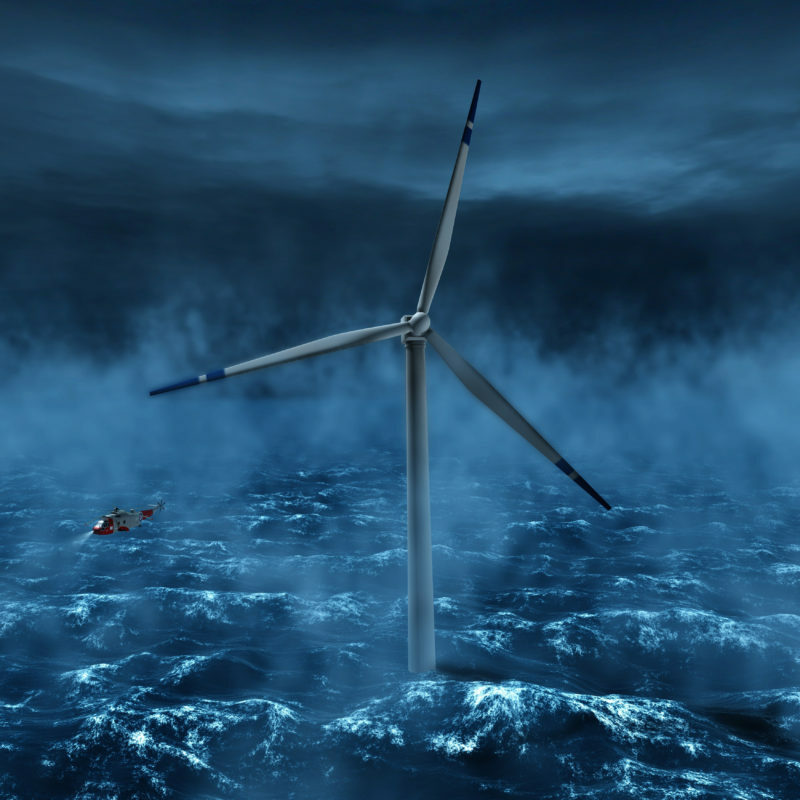 Note that the wind systems could also be installed on top of the OTEC system. In addition to conventional land-based wind systems and other solar technologies, such as photovoltaic cells, either sea-based Windship or Ocean Thermal Energy Conversion (OTEC) hydrogen production systems can also displace all fossil and nuclear fuels now used worldwide forever, while saving ocean ecosystems in the process. Hydrogen fuel can be manufactured from water with any source of electricity, but the Phoenix Project baseline assumptions focus on wind systems because they presently generate electricity for less cost than any other solar energy, fossil fuel or nuclear technology, and they can be rapidly mass-produced like automobiles on a scale to permanently displace the use of all fossil and nuclear fuels worldwide. While the U.S. has vast land areas for wind systems, it has equally vast ocean areas that could be utilized. Sea-based “Windship” hydrogen production systems, like those pictured above, could in and of themselves allow the U.S. and other countries to eliminate the need to rely on the rapidly diminishing fossil and nuclear fuels, while providing a vast sanctuary for the remaining fish and marine organisms on the seabed floor that are in the final stages of being hunted into extinction. Indeed, according to a wide-range of scientific studies, the global ocean ecosystems are already over 90% dead, and deploying large fleets of sea-based wind systems may be the only action that will allow the remaining marine organisms to recover (please refer to the Ocean Destruction paper attached on the Papers button link on this websites navigation bar). 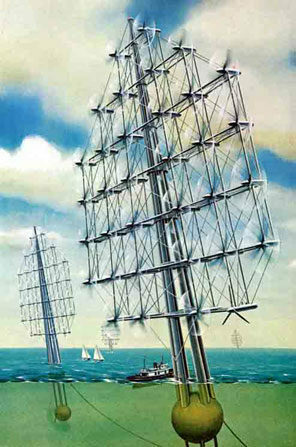 The sea-based wind system image on the top was provided courtesy of Norsk Hydro, whereas the lower image on the left of a Windship hydrogen production system was initially published by National Geographic in December of 1975 and was developed by William Heronemus, a former naval architect and Professor of Engineering at the University of Massachusetts, who pointed out that from a technology perspective, both OTEC and wind-powered hydrogen production systems could have been mass-produced in the 1920s. Note that the tugboat is delivering the crew that live and work in the submerged spherical hulls that also contain the electrolyzers that extract hydrogen from the seawater with the electricity generated by the wind turbines. 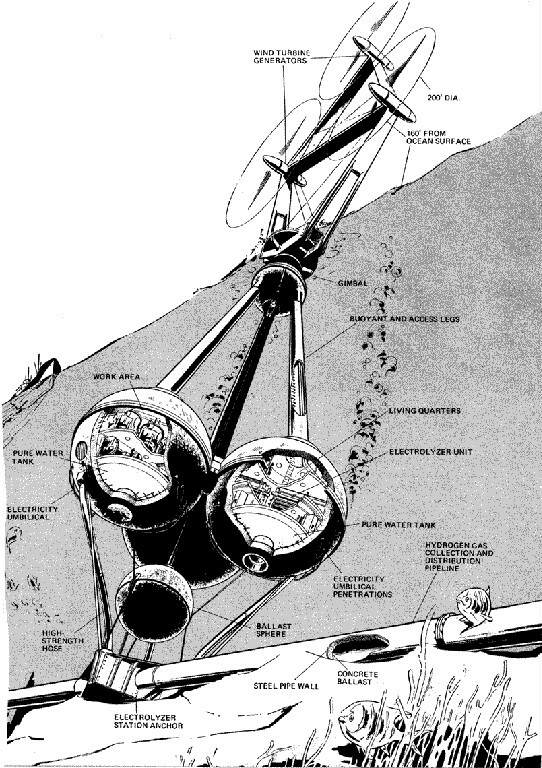 The OTEC system shown above was developed by Lockheed in the 1970s, and Lockheed engineers also developed detailed designs on how to modify existing commercial aircraft to use liquid hydrogen fuel, which are shown below in this report. 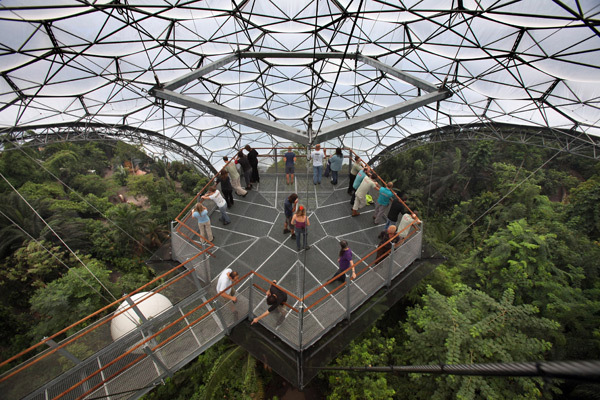 OTEC systems use the largest solar collector on the Earth, which are the tropical oceans. OTEC systems were first developed in the 1800s by a French physicist, and field tested in the 1920s off the coast of Cuba, but what makes them unique is that they are the only Earth-based solar power technology that can operate 24 hours a day, seven days a week. 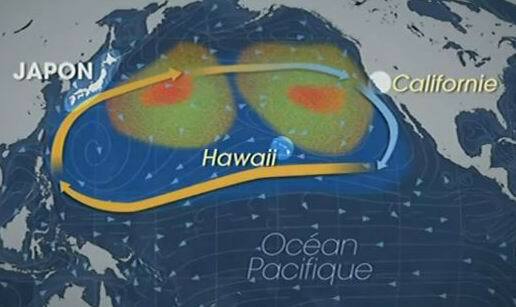 This is because the temperature differentials in the tropical oceans, which power the OTEC cycle, are constant. Like wind systems, OTEC systems alone also have the potential to displace all fossil and nuclear fuels now used worldwide, and they can be engineered to generate both vast quantities of fresh water and seafood as by-products. It is why mass-producing a mix of such renewable systems can provide sustainable prosperity without pollution for the global human community. While the Regan administration terminated the OTEC research and development effort, Lockheed (now Lockheed Martin) has continued to develop OTEC systems, which are shown on their website. 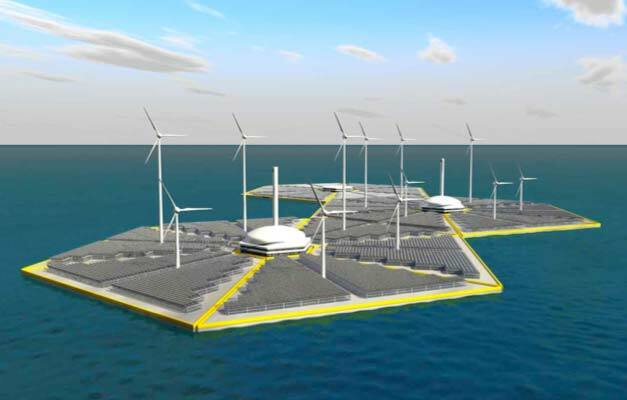 The image shown above shows a hybrid Solar Hydrogen Island where several OTEC power plants could also be integrated with both wind and photovoltaic solar cells. 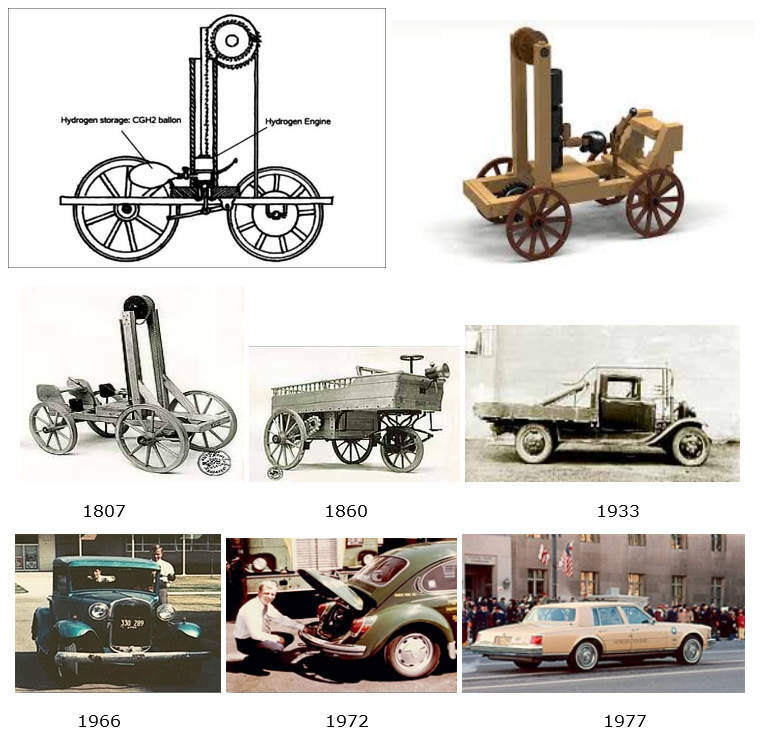 In the U.S., Roger Billings, a young engineer in Provo, Utah first modified his family’s lawnmower to use hydrogen fuel when he was still in high school, and in 1966, he proceeded to modify his father’s Model A Ford (upper left) for his high school science project. In 1972, when he was a student at Brigham Young University, he and his team modified a Volkswagen (upper center) to operate on hydrogen, and they won first place for emissions in the Urban Vehicle Design Competition in Ann Arbor, Michigan. Atmospheric air is approximately 78% nitrogen and only about 22% oxygen, and the high combustion temperatures in internal combustion engines causes oxides of nitrogen (NOX) to form from the nitrogen in the air. In order to reduce NOX emissions, Billings and other automotive engineers, including those at Los Alamos National Laboratory and BMW, have injected water into the cylinders to reduce the engine combustion temperature so the oxides of nitrogen would simply not be created in the first place. Indeed, the hydrogen-powered Volkswagen was shown to actually clean the ambient air and as such, it was given a negative number for unburned hydrocarbons and carbon monoxide. In 1977, Roger Billings designed a hydrogen-powered Cadillac Seville (upper right), as part of a Hydrogen Home project he developed. 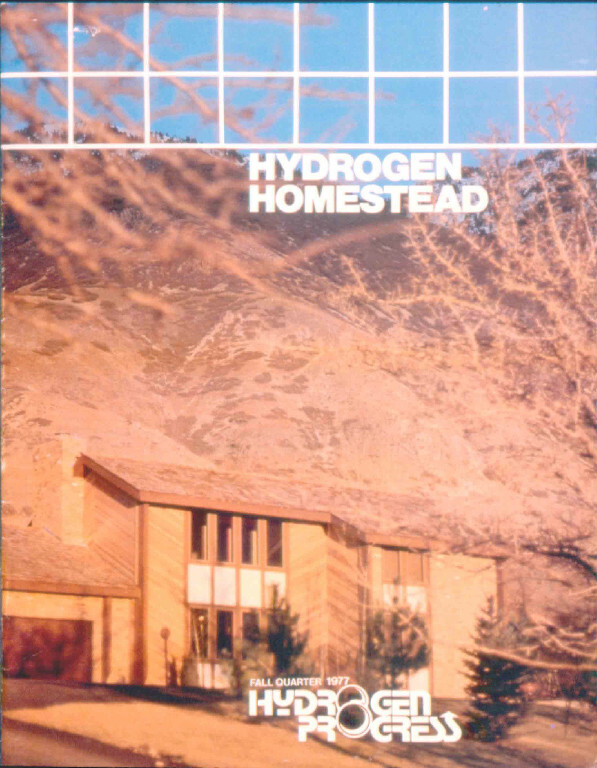 The Billings Hydrogen Home pictured above in Provo, Utah was completed in 1977 and had all of the vehicles and appliances, including the water heater, gas range, BBQ and even a Coleman camping stove modified to use hydrogen fuel. The Cadillac for the home (pictured above) was included as part of President Jimmy Carter’s inaugural parade. Note that the exhaust coming from the hydrogen-fueled Cadillac is pure water vapor. If the exhaust was captured, it would be much fewer impurities than any tap water now used. According to an ABC News report in 1991 by Peter Jennings, one of the first Solar Hydrogen Homes ever built in the U.S. by John Lorenzen, a Midwest farmer with a 6th grade education who built his own wind powered electrical generators in his barnyard workshop. He used the electricity from his wind generators to make the hydrogen from barrel of water. Lorenzen then modified his pick up truck to use the hydrogen fuel as well as gasoline. While hydrogen is the ultimate rocket fuel because it has highest energy to weight ratio of any fuel, John Lorenzen proved that one does not need to be a rocket scientist to make it and then use it as fuel at home. In 2004, California Governor Arnold Schwarzenegger worked with the engineers at General Motors to have his Hummer modified to use gaseous hydrogen fuel as part of California’s Hydrogen Highway project. Hydrogen is the only “universal fuel” that can power any existing internal or external combustion engine, appliance or power plant. As such, rather than waiting for costly fuel cells or other new hybrid or plug-in vehicles, it is far less expensive and much quicker to simply modify all of the existing internal combustion engines and vehicles to use hydrogen or gasoline with a flip of a switch. Hydrogen can be stored as a solid in hydride materials, as a compressed gas or a cryogenic liquid, which most closely simulates gasoline in terms of weight, range and volume. In fact, it is highly likely that hydrogen storage systems will use a combination of all three phases of hydrogen. And given that the exhaust from a hydrogen-fueled engine has been shown to be cleaner than the air that enters the engine, air pollution from vehicles would virtually disappear even in rush hour traffic. Thousands of vehicles, including the diesel engines and even the torpedo’s used in submarines, were modified to use hydrogen fuel in the 1920’s and 1930’s in Germany and the UK, thus no new technology needs to be developed to implement hydrogen as the only “universal fuel” that can power every existing engine, vehicle, appliance or power plant. 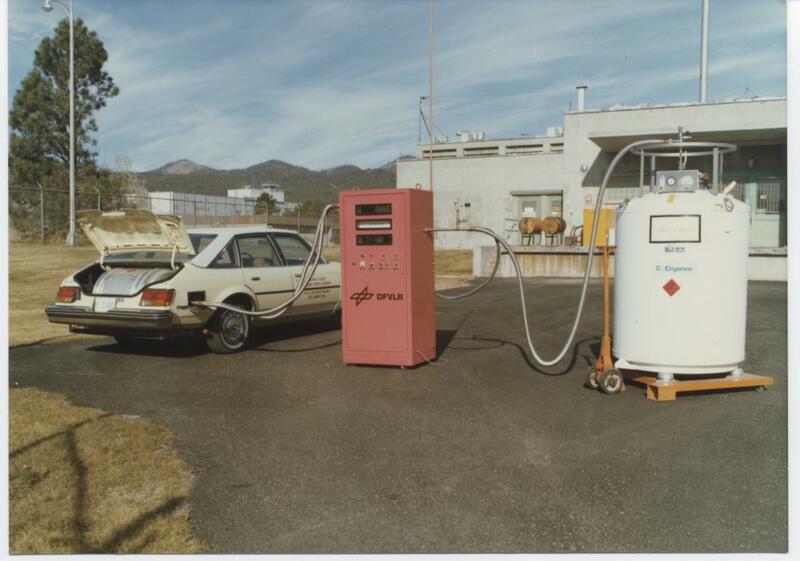 A 1979 liquid hydrogen fueled Buick modified and tested at Los Alamos National Laboratory in New Mexico, with a self-service pump and cryogenic storage Dewar. Investigators at Los Alamos National Laboratory (LANL) in New Mexico modified the 1979 Buick pictured above to operate on liquid hydrogen fuel, which most closely resembles gasoline from a perspective of volume, weight and engine performance. The self-serve hydrogen pump is attached to a white cryogenic liquid hydrogen storage tank, and in their final report, the Los Alamos investigators led by Dr. Walter Stuart, concluded that liquid hydrogen could be safely used in vehicles by members of the general public. 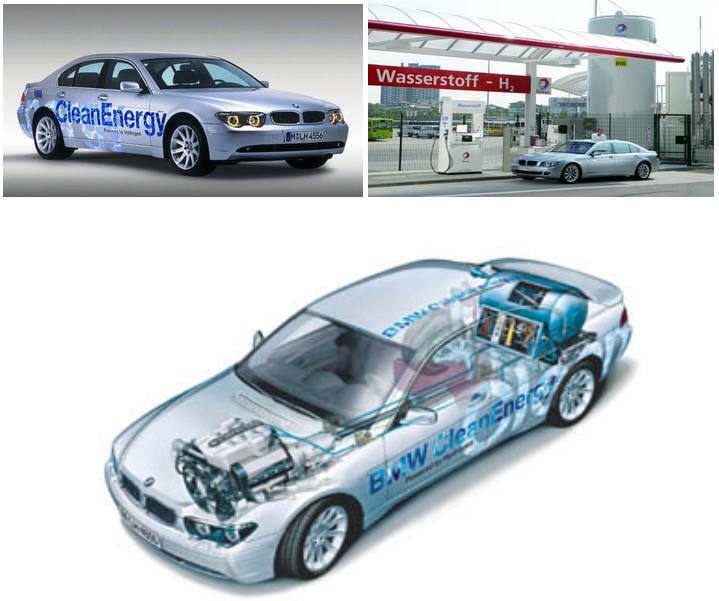 BMW is the only major automobile manufacturer that has been modifying its vehicles to use liquid hydrogen for over 30 years because it is the only pollution-free fuel that does not force their customers to give up performance, range or the luxury of driving a full-sized vehicle. The hydrogen BMW still has its gasoline tank as a reserve tank, and the engine can use either fuel with the flip of a switch. In a carefully controlled test funded by the U.S. Department of Energy, DOE, Dr. Michael Swain and his colleagues at the College of Engineering at the University of Miami initiated similar fuel leaks with two identical vehicles. 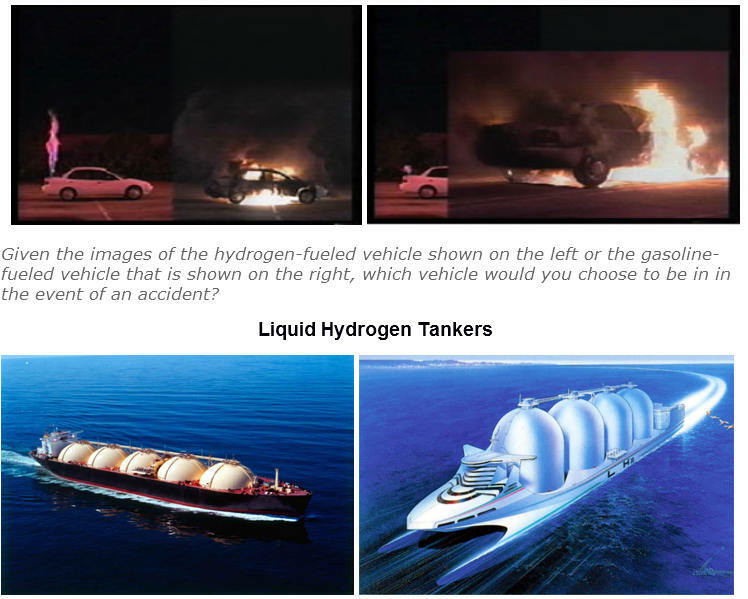 As the images below show, the hydrogen-fueled vehicle on the left suffered no temperature increase or physical damage to the passenger compartment, whereas the gasoline-fueled vehicle was totally consumed in flames in less than three minutes. This underscores the impact of carbon when it is combined with hydrogen to form a highly-deadly hydrocarbon fuel. BMW has also modified its smallest and most fuel efficient vehicle, the Mini Cooper (upper left), to operate on liquid hydrogen, which is stored under the rear passenger seats, as well as the world’s fastest liquid hydrogen-fueled race car, which has exceeded 180 mph. 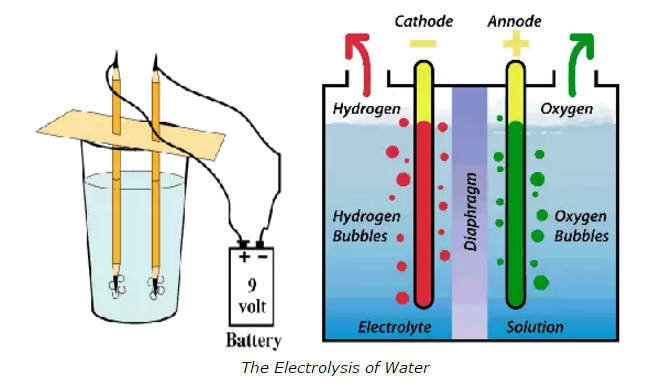 Fuel cells, which were first developed in the 1800s, are able to create electricity from combining hydrogen and oxygen. Fuel cells were successfully used in the space program are also being developed for automotive applications, such as the General Motors “Hy-Wire” fuel cell vehicle that is pictured above. The Hy-Wire system that does not have any of the conventional mechanical parts between the driver and the wheels because like advanced aircraft, everything runs on electronic sensors and motors. However, the cost of fuel cells is still very high. The initial small fuel cells used in vehicles being tested in California cost over a million dollars each, and even in mass-production, GM estimated that the cost of the fuel cells would still cost between $50,000 to $100,000, which would exceed the cost of the car itself. While fuel cells may be practical at some point in the future, given the senior scientists at the National Academy of Sciences have stated that fossil fuels need to be phased-out, the only practical solution is to simply modify existing vehicles and engines to use hydrogen as well as gasoline with the flip of a switch. Given that large amounts of hydrogen are required to make gasoline from oil, the major oil companies are well aware of its use. However, all of the oil companies now obtain the hydrogen they need from nonrenewable natural gas and other hydrocarbon resources where the hydrogen atoms are chemically bonded to carbon atoms. Unfortunately, the oil companies are only focused on making hydrogen from natural gas, coal, uranium and other energy resources that are highly-polluting and rapidly diminishing worldwide. Hydrogen is the simplest, most abundant and lightest element in the known universe, and because it is lighter than air, it goes up and away within seconds if a leak or accident occurs. This is why hydrogen is much safer than gasoline or other hydrocarbon fuels, where the hydrogen is chemically bonded to carbon, which is heaver than air, and therefore causes the hydrocarbon fuel to stick to passengers like glue and form explosive mixtures when leaks and accidents do occur. While the images of the Hindenburg accident were horrific, it is important to note that according the the official accident report, two-thirds of the passengers and crew survived the accident. The Hindenburg was not using hydrogen to fuel its Mercedes Benz engines. Rather, because hydrogen is the lightest element in the universe, it was used used as a lifting gas. 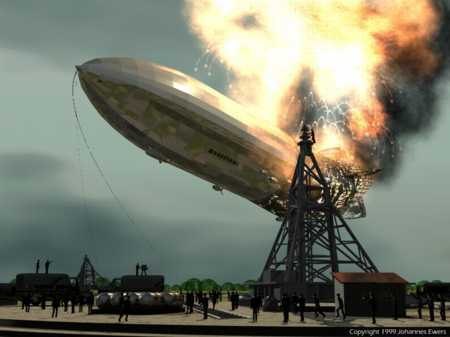 However, even when the hydrogen was ignited from the highly-combustible aluminum-based paint used on the exterior of the airship, the hydrogen did not “explode.” Rather, it caught fire and as the fire spread, it went up and away from the passengers as the airship gradually fell to the ground. According to the accident report, two-thirds of the passengers and crew lived, and of the 35 people who died in the accident, 33 died because they panicked and jumped from the airship and they died from the fall. Two individuals were burned to death, but they were not burned from the hydrogen, but rather from the diesel fuel that was stored in large tanks on the airship to fuel the airship’s engines. As such, the real lesson from the Hindenburg accident is how safe hydrogen fuel is in the event of an accident when compared to highly-toxic and non-renewable hydrocarbon fuels like gasoline or so-called natural gas. The liquid hydrogen tanker pictured (above left) was built in the U.S. in the 1970s by General Dynamics. Fleets of similar cryogenic tankers are now used worldwide, primarily for transporting liquid natural gas (LNG). However, unlike liquid hydrogen, LNG tankers and storage facilities are very dangerous because the hydrogen in natural gas is all chemically bonded to carbon. This allows the LNG to collect in large pools and form highly-explosive mixtures. The advanced liquid hydrogen supertanker pictured on the right, which looks more like a cruse ship, is being developed in Japan by Kawasaki Heavy Industries. Hydrogen can be transported as a cryogenic liquid in tankers just as oil is, except that oil is highly toxic and dangerous if it is spilled, whereas hydrogen is completely non-toxic, non-polluting and relatively safe in the event of accidents or spills. If the Exxon Valdez was transporting liquid hydrogen instead of oil, no ecological damage would have occurred as a result of the accident. It is worth noting that even though the accident took place more than 20 years ago, the estimated 11 million gallons of oil that was spilled has never been able to be cleaned up and is still contaminating the Alaskan environment. While the BP Oil spill in the Gulf of Mexico in 2010 is estimated to have released over 200 million gallons of oil, according to the Oil in the Sea report published by the National Academy of Sciences (NAS), over 1 trillion gallons of oil is released each year not from accidental spills, but from simply using the oil as a fuel and as a lubricant. This is a major factor why the NAS has warned that the use of oil and other fossil fuels are rapidly making the earth itself uninhabitable. The above image was generated by the Electric Power Research Institute (EPRI), the largest utility research organization in the U.S. Unlike electricity, hydrogen can be stored and delivered to national and international markets by cryogenic tanker trucks, ships or underground pipelines that can also be engineered to transmit electricity as well as the hydrogen. The so-called “Smart” grid proposals that are now being proposed by the Obama administration involve condemning private property in order to build thousands of miles of conventional unsightly and inefficient high-voltage transmission lines across the country, which will ultimately cost over a trillion dollars. The reason the conventional transmission lines are placed up in the air is because they are hot, which is due to the fact they are leaking energy, and the heat is then dissipated into the atmosphere. The Phoenix Project proposal, by contrast, calls for building a cryogenic Interstate Hydrogen “Supergrid” system that was first proposed in the 1970s and is now being developed by the Electric Power Research Institute (EPRI), which is the largest utility research group in the U.S. The hydrogen pipelines would be able to carry highly-efficient superconducting high-voltage transmission lines underground, as well as the gaseous and liquid hydrogen fuel that will be made from electricity ideally made from the wind and other solar and geothermal resources. 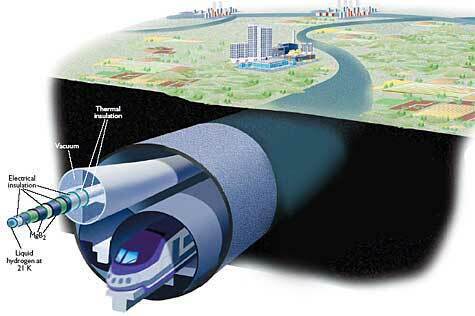 As the Supergrid image above also shows, a magnetically levitated train could also be incorporated in the system. 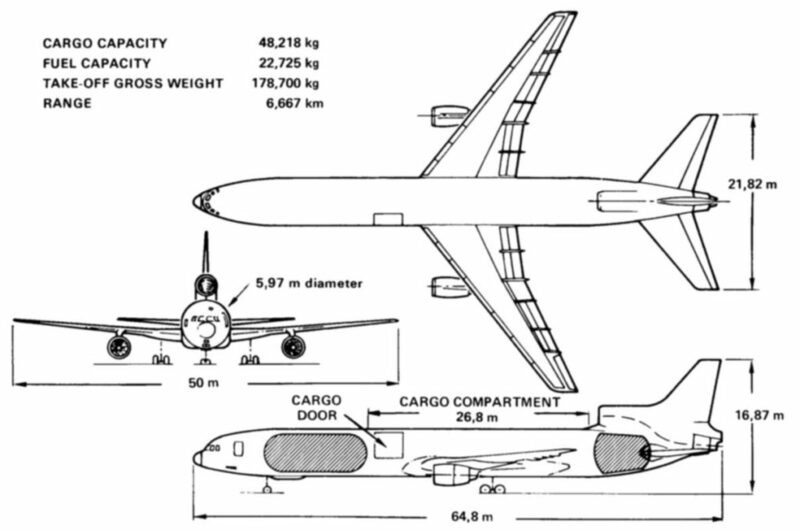 In order to modify existing aircraft, Lockheed engineers in the 1970s simply located the two liquid hydrogen storage tanks (Dewars) in the fuselage of the aircraft. This would make hijacking the aircraft virtually impossible because the flight crew is separated from the passenger compartment by one of the liquid hydrogen storage tanks. The takeoff weight of the hydrogen-fueled aircraft was reduced by over 40%, the aircraft was stronger and much safer in the event of accidents; the wing area was smaller; and the engines were quieter and required less maintenance because hydrogen combustion does not produce organic acids or carbon deposits in the engines. 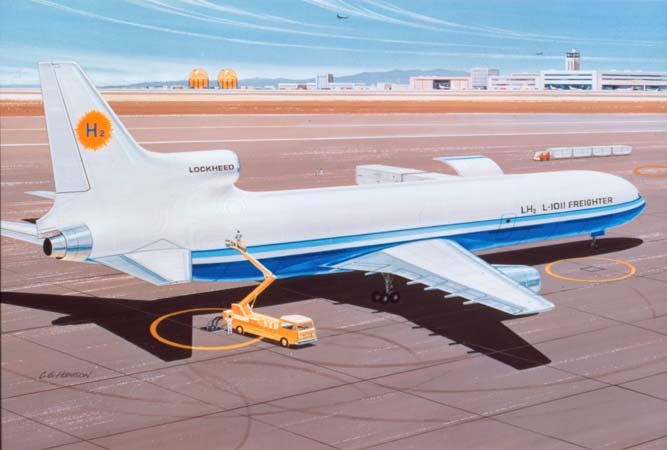 A proposed Lockheed liquid hydrogen-fueled L-1011 aircraft shown above is being refueled by the two spherical highly insulated liquid hydrogen storage tanks (referred to as Dewars) that are located in the distance. 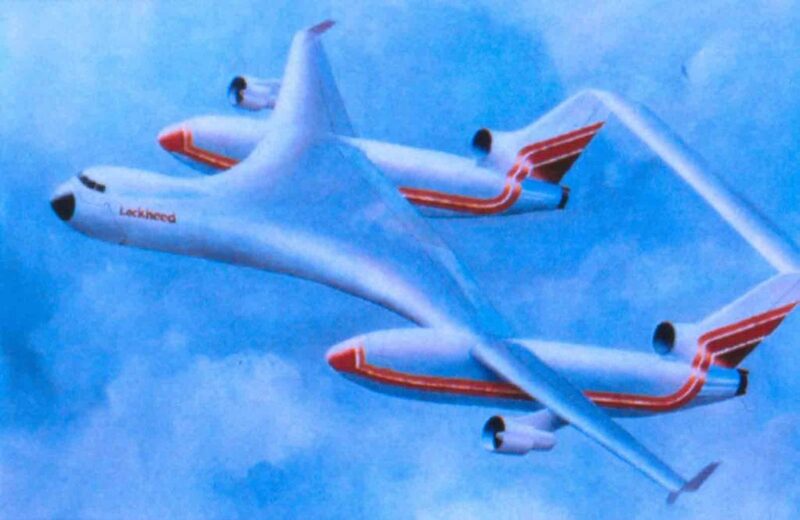 The advanced liquid hydrogen-fueled aircraft shown above was also designed by Lockheed but it is fully optimized in its design for liquid hydrogen fuel. Given the lighter weight, the aircraft is significantly larger than conventionally-fueled hydrocarbon-fueled aircraft, where the hydrogen is chemically bonded to carbon, as it is in gasoline and diesel fuel. 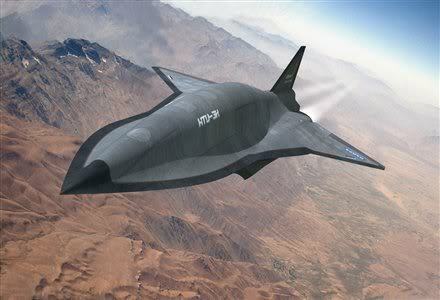 Boeing’s liquid hydrogen-fueled replacement for the SR71 Blackbird spy plane shown above is a superdrone flying twice as fast (Mach 6) and it will be fully-weaponized for high-speed air strikes. Liquid hydrogen has been used as a primary rocket fuel because it has the greatest energy per weight of any fuel. This is why it has been used by NASA to fuel all of the Saturn V moon rockets as well as the fleet of Space Shuttles. Note the three liquid hydrogen-fueled engines, which are located on the tail of the Space Shuttle, where the light-blue hydrogen flame is almost invisible. This is in contrast to the solid-fuel rocket boosters (SRBs) that are located on the sides of the shuttle’s main hydrogen and oxygen fuel tanks. 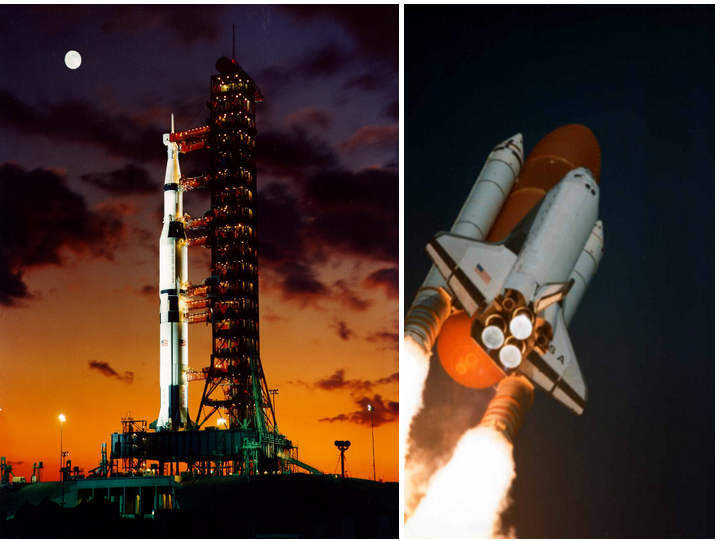 While the hydrogen engines are essentially pollution free, the SRBs emit a highly toxic aluminum exhaust, which damages the atmosphere each time the Shuttle is launched. It is important to note that when the Columbia Space Shuttle exploded in 2003, it was not the liquid hydrogen systems that caused the problem, but the seals on one of the SRBs that failed, which then caused the spacecraft to explode, killing all of the astronauts on board. 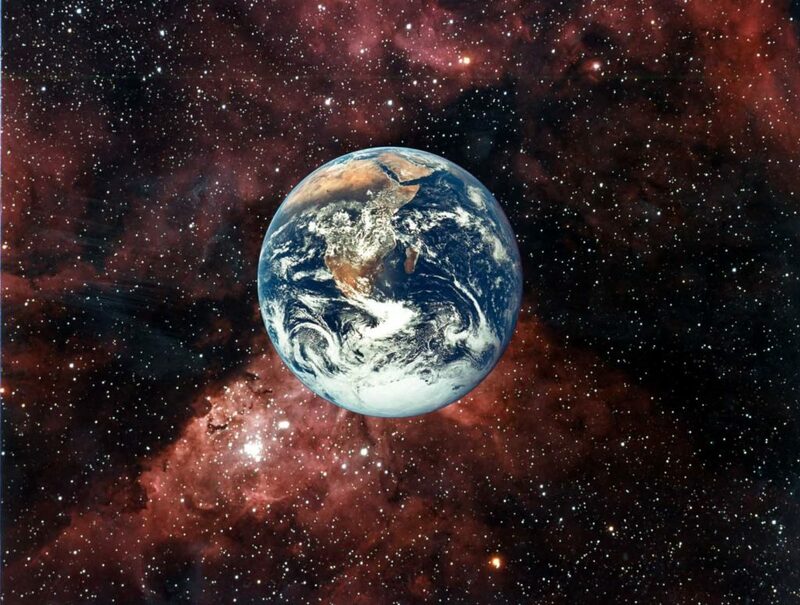 The Earth is the only planet in the known universe that can sustain humanity and the other mammals, yet the arth’s biological life-support systems are in the final stages of being made uninhabitable because of humanities reckless exploitation, chemical contamination and mindless addiction to non-renewable fossil and nuclear fuels, which are both highly-polluting and rapidly diminishing worldwide. It is why a “transition of substance” to a Solar Hydrogen Economy needs to be implemented with wartime-speed (i.e., by 2020). 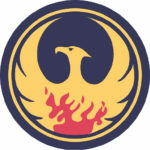 The Phoenix Project plan will provide a fundamental solution to the energy and economic crisis, as well as many of the most serious environmental problems by rising from the ashes of oil and other fossil fuels to a Solar Hydrogen Economy with wartime-speed with technologies that could have been mass-produced in the 1920s. It is important to note that the Phoenix Project plan that complies with the specifications and warnings of professor James Hanson, NASA’s chief climate scientist, and the senior scientists at the National Academy of Sciences, that fossil fuels need to be phased out within 10 years or humanity will pass a tipping-point of no return, which will destabilize the climate to such an extent that the earth’s primary food production systems will fail. Indeed, the tundra and methane ice crystals in the Arctic are now rapidly melting, which could release hundreds of times more carbon into the atmosphere than is now generated from burning fossil fuels, which underscores the need to shift to a Solar Hydrogen Economy with wartime-speed. Carbon dioxide levels are already at 400 parts per million and they need to be less than 300 in order to minimize the impact of the worldwide global famines that have already begun. Scientific studies have documented that the global ocean ecosystems are now more than 90% dead from the free market forces of unregulated overfishing and the remaining fish are so contaminated from mercury and radioactive isotopes emitted from coal plants they are unfit to eat. The major forest ecosystems in the Rocky Mountains and the Cascades are being destroyed from the warmer temperatures, and the bees, which are critical in pollinating food crops, are disappearing, along with the bats and frogs as part of a global mass-extinction event that is already well underway. This time it is not the reptiles, but the mammals that are at risk. There is a remarkable precedent for such a transition of substance. Some 3.5 billion years ago, the Earth’s population of protein-scale nanobes and micron-scale microbes they created was exponentially increasing, and as such, they were also faced with a mass-extinction event because their non-renewable hydrocarbon reserves in the primordial soup were rapidly being consumed. 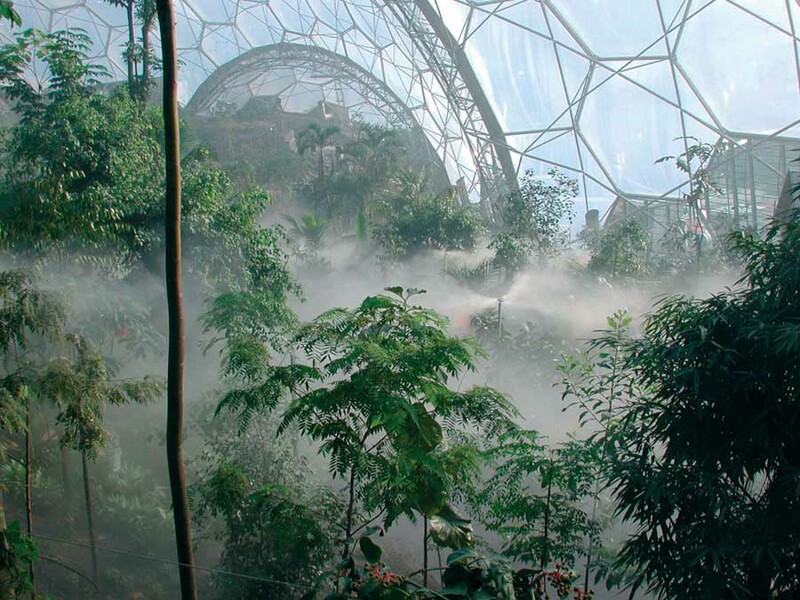 Their solution was to re-industrialize their civilization around photosynthetic microbes and plants that could extract hydrogen from water with solar energy, and this system has been successfully working on a global scale with no pollution ever since. Although President Obama has spoken about the need to emphasize renewable energy technologies, his expenditures are less than 1% of what are needed, and because he and his advisors assume there is no “silver bullet” solution, they are continuing to pursue all energy options, including offshore drilling, coal, corn-based ethanol and carbon and nuclear energy options that waste both time and money because they will never be able to make the U.S. energy independent — much less energy independent of fossil and nuclear fuels, which are rapidly diminishing and highly polluting. The U.S. currently spends over $1 trillion annually on fossil fuel energy sources, and should be conservatively spending at least $1 trillion annually for nuclear energy programs, especially given the entire U.S. fleet of nuclear reactors should be decommissioned, and none of the nuclear wastes have ever been “cleaned up” or properly stored for the eons that will be required. Given the USA now uses just under 100 quads of energy annually, approximately two million two megawatt wind-powered hydrogen production systems would be able to displace all of the fossil and nuclear fuels, and because wind systems are like automobiles from a manufacturing perspective, they could be mass-produced in less than 2 years once the tooling is in place. According to the U.S. Energy Information Administration, the global demand for energy in 2011 was approximately 520 Quads, and roughly 60 percent of that amount was lost as waste heat. As such, approximately 12 million two megawatt wind powered hydrogen production systems, operating with a 30% capacity factor, would permanently replace the use of all of the toxic and non-renewable fossil and nuclear fuels now used worldwide. And because the U.S. has vast land and offshore wind resources, this reindustrialization effort has the potential to transform the U.S. from being the world’s largest debtor nation and energy importer into a multi-trillion dollar hydrogen energy exporter with a fuel that is non-toxic, pollution-free, and exhaustible, thereby providing a renewable rate of return on the investment. It is worth noting that unlike the current economic stimulus proposals, the Phoenix Project solar hydrogen re-industrialization effort would not be creating short-term make-work jobs, but millions of high-quality private sector jobs that would generate over a trillion dollars of wealth annually with hydrogen production and end-use technologies. And because solar-sourced hydrogen is both inexhaustible and pollution-free, it will fundamentally eliminate many of the most serious climate change and other environmental and related health care problems with technologies that could have been mass-produced in the 1800s. This underscores the fact that the obstacles to this “transition of substance” are not technical or economic — they are political. Elections come and go, but very little changes regardless of who gets elected. Given this reality, and given that the current two party system of government in the U.S. is so fundamentally corrupted by multinational oil and other corporations and other special interests, only a fundamental change to the U.S. Constitution can resolve the problem. The Democracy Amendment that is posted on the DemocracyAmendmentUSA.net website would transfer political power from the lobbyists and two political parties to the majority of U.S. Citizens, which is the “trigger mechanism” for implementing a Solar Hydrogen Economy because it would make lobbying and bribery by corporations illegal. While most people assume the U.S. already has a democratic form of government, such misinformation only serves the interests of corrupt elected officials and lobbyists who write the bills that most members of congress do not even read before they vote to approve them. The key difference in a Republican form of government compared to a Democracy is that a Republic is “representative” government, which is in and itself rule by the tiny few (i.e., far less than one-half of one percent of the citizens in the USA are elected representatives), but given the way the seniority system in Congress works, an even much smaller number of Committee Chairman are empowered to not only conduct business in secret, but they alone get to determine which bills are even allowed to come to come up for a vote in the Congress. Thus lobbyists only have to bribe and otherwise influence a tiny number of the already tiny number of elected officials that are elected to the Congress, and with the unverified computerized voting machines that are easy to hack and are now in widespread use, even the elections are highly suspect. In a Democracy, however, the majority of the citizens would be in charge, which means the lobbyists would have to bribe literally millions of citizens in order to get their way. While the first democratic form of government was in ancient Greece, at present, the only country that has a true democratic form of government is Switzerland. 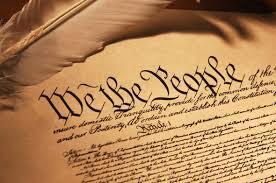 Once the majority of citizens are in charge of the federal and state governments, all things will then be possible. In addition to ending government secrecy and bribery and hiring millions of Americans immediately to replace all toxic fossil and nuclear fuels with poison-free and renewable hydrogen fuel generated from cannabis and the sun, wind and water. With the majority in charge, it will also then be possible to implement a Fair Accounting Act that will work with the National Academy of Sciences to factor in reasonable environmental and health care costs of all products. It will be possible to end the use of unverified voting machines, federal budget deficits, and the production of chemical and radioactive wastes, while having the financial resources to provide a universal non-profit healthcare system that would eliminate the need for health insurance, and no longer allow physicians and dentists to “operate” on commission. The outdated factory school systems could be rapidly replaced with ultra-high quality educational programs developed and produced by the very best educators and animators at little or no cost for all American citizens. These programs would allow each student to progress at their own speed, and emphasize critical thinking skills that should be used every time they analyze information. Such educational excellence should be provided at no cost on the internet, or be made available at a small cost on CD/DVDs. Details on these proposed amendments are available on the papers section of this website, and any comments or suggestions on any of these proposed constitutional amendments would be greatly appreciated. It is important not to forget that due to the Exponential Age in which we live, humanity is rapidly accelerating into a technological “utopia” of molecular medicine that by eliminating aging and disease will give birth to a new biocybernetic species: Homo Immortalis. Such extraordinary developments, however, are dependent on avoiding the ecological “oblivion” of mass-extinction that is already well underway. and the decisions made in the nest few years will determine which future evolves. For details on the critically important nature of exponential growth, please refer to the Phoenix Project video documentary and the Exponential Icebergs paper that are both posted in the video and papers section of this Phoenix Project Foundation website. For a discussion of the scientific, ethical and religious implication of such developments, please refer to the Revealing Science of God paper that is available on the shop.PhoeinxProjectFoundation.us ebookstore. Copyright © 2014 Phoenix Project Foundation.US. All rights reserved. Thank you for your support and your donation to the Phoenix Project Foundation,which is a 501-C3 Scientific and Educational Organization. As such, your donation to assist the Foundation is tax deductible.